A chilling mystery where nothing is what it seems and everyone is a suspect. Eighteen-year-old Jill Charron wakes up in a hospital room, leg in a cast, stitches in her face and a big blank canvas where the last six weeks should be. She comes to discover she was involved in a fatal accident while on a school trip in Italy three days previous but was jetted home by her affluent father in order to receive quality care. Care that includes a lawyer. And a press team. Because maybe the accident... wasn’t just an accident. But with no memory of what happened and what she actually did, can Jill really prove her innocence? 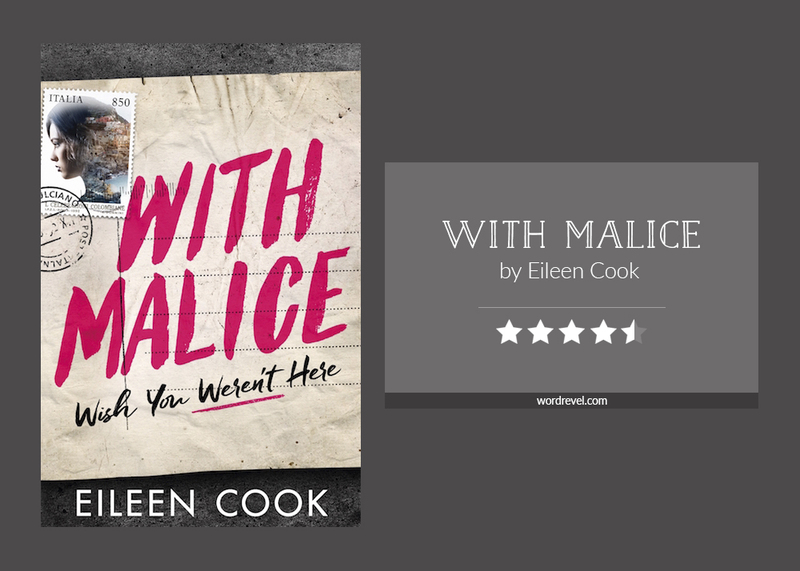 What I liked about With Malice was getting to piece Jill’s memories together as her recollection grew. While amnesia does tend to be a plot device under these circumstances, I thought Eileen Cook employed it very artfully in her latest book. I was completely sucked into Jill’s journey, reading her story, witness accounts, social media posts and comments, etc. It was very well rooted in contemporary times, particularly with the inclusion of social media. Social media tends to be a massive source of speculation nowadays. The fodder it provided in With Malice was both fairly entertaining and worrying as it very well reflected its potential for destruction. While I had an inkling of what might’ve gone down fairly early on, I was still constantly on the edge of my seat. I second guessed my predictions a number of times, which really was half the fun of reading With Malice. Part of me was a little disappointed that the setting wasn’t Italy per se. Italy did feature in various accounts but not in a way that transported readers to another part of the world. Thankfully, there were a few colourful flashbacks that brought enough atmosphere to invoke a sense of wanderlust. At the core of With Malice lay the mystery of what and how things happened. Jill was a likeable character despite the doubts that were cast upon her integrity. As I sat on the edge of my seat, trying to figure things out faster than the detectives, I also rooted for Jill’s recovery amidst the drama she was stuck in. YESSS I’m really looking forward to reading this one and the underlying mystery and how it keeps you guessing! The flashbacks also sounds really fascinating. I’m glad the amnesia angle worked out really well too! I’m all about that cover! I read a lot of crime thrillers but all adult and not too many YA or psychological thrillers so I would love to get into this. It kind of reminds me of the plot of Dangerous Girls except with amnesia.